Do you or someone you know suffer from depression? If so, you know the illness can have devastating consequences for not only the person suffering, but their families and loved ones as well. Depression is a very serious condition that sadly, affects more than 16 million adults in the US. Until the past few years medication and psychotherapy have been the primary modalities used to treat depression. 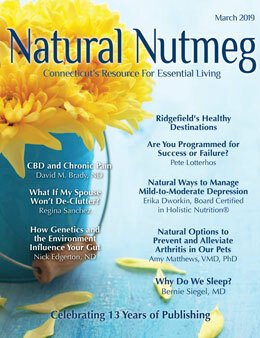 Transcranial Magnetic Stimulation (TMS) offers another solution; one that does not involve medication and side effects. TMS therapy offers hope to people who suffer from depression. TMS targets the brain directly – Transcranial (through the cranium), Magnetic (with a strong magnet), Stimulation (rapid or slow pulses). The brain is an electrochemical organ and TMS gets to the activity in the brain at a cellular level. TMS uses an MRI strength magnetic pulse to change the electrical activity in the brain. With depression the goal is to awaken (rapidly stimulate) areas of the brain that are underactive. With anxiety the treatment focus is to calm or down-regulate (with low frequency stimulation) the areas that are overaroused. Illnesses such as anxiety, OCD, PTSD, migraines, Bipolar, addiction, cognitive decline and many more can be treated with TMS. Treatment can be tailored to an individual’s brain if the specific treatment site and brain activity levels are understood. Using the results of an EEG recording (Electroencephalograph), the data if analyzed properly can produce a “brain map,” which details the electrical activity in an individual’s brain. Neuroscience is advancing at a rapid pace. Now, with technology that can look at the brain as a physical organ we as a culture can begin to lift the stigma associated with mental health. When we think of depression as a “brain disease,” and not some personal flaw, we can begin to release the past belief that, “something is wrong with me.” We can compare the disease of diabetes when the pancreas is not functioning properly to the disease of depression due to the brain’s malfunction. Diabetes and other illnesses do not carry the stigma like diseases of the brain. It is time to change the narrative about mental health. We see firsthand the effect that illnesses like depression can have on individuals as well as their families and loved ones. When the brain is not functioning properly one’s decision making is compromised. With poor choices our lives can become unbalanced and chaotic. Too often patients find us after suffering for many years without relief. The typical path for the treatment of depression is for doctors to prescribe an antidepressant. It may take many trials to find one that helps and while these treatments work for many people, unfortunately, not all. In fact, in any single antidepressant trial only a minority of patients achieve full remission, and as trials of antidepressant medication increases, so can side effects and the potential for treatment failure. TMS is a proven option that is safe and effective. Despite these promising statistics and results, a common misconception is that TMS treatments are last-resort options when all else fails, but this isn’t the case. 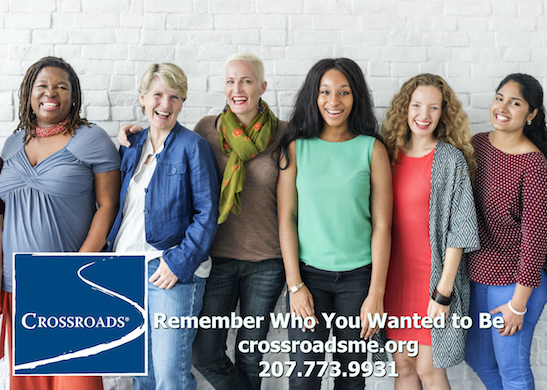 The American Psychiatric Association recommended TMS as a second-line treatment when they changed their guidelines for treating depression in 2010. Unlike electroconvulsive therapy (ECT), TMS is non-invasive and allows patients to continue their regular daily activities immediately following treatment sessions. It’s a great option, and one many prefer, as it’s also free from systemic side effects often seen with antidepressant medications. A common side-effect with TMS treatment for depression is improved cognition! TMS shouldn’t be brought into play in the fourth quarter of the game. We see the positive impact it can have and urge doctors across specialties to consider TMS therapy earlier in their patients’ treatment plans in the hopes that we can shorten the length of their suffering. Patients don’t have to settle for living in a disconnected fog, struggling to get by as they try to function with their depression. With therapy like TMS, remission from depression can be achieved. Most insurance providers cover TMS to treat depression (depression only at this time) after a pre-approval process. The common requirements are that one must have tried at least 4 different antidepressants with one from a different class, and also have done psychotherapy. TMS is available by prescription and typically administered daily for six weeks and then a taper over the next 3 weeks. Treatment sessions last approximately forty-five minutes and are administered by a TMS Coordinator who stays in the room and monitors the treatment. Unlike electroconvulsive therapy (ECT), TMS is non-invasive, allows one to resume daily activities immediately following treatment sessions and is free from systemic side effects often associated with antidepressant medications. TMS is a medical procedure and requires a prescription from a psychiatrist. Our Medical Director, Dr. Miles Simmons, MD, is Board Certified in Psychiatry and Neurology and Dr. Ed Bilotti, MD, an Affiliate TMS Provider is Board Certified in Psychiatry and Addition Medicine. Dr. Sean McCloy, MD is a Board-Certified Diplomate in both Family Medicine and Holistic Medicine and an Affiliate TMS Provider who oversees patients in treatment for illnesses other than depression. 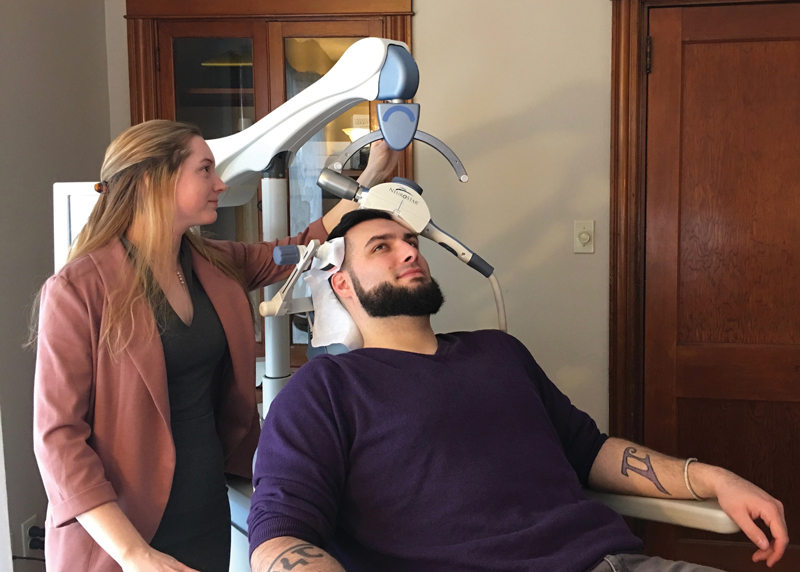 Crystina Mendolia, BS in Psychology and Neurology from UNE, manages and delivers the TMS treatments and Elliott Comeau, trained as a TMS Coordinator also delivers the treatments. Call or email for a free consultation and see if TMS is a good fit for you. 207.233.8804. 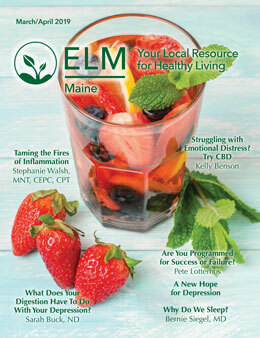 Info@neurohealthmaine.com.